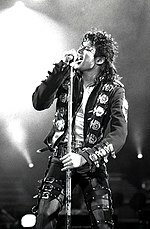 Michael Jackson dia mpilalao, mpanao soa ho an'ny hafa, talen-koronantsary, mpanoratra senariô, Poeta, mpitendry mozika, mpanoratra ny tantaran'ny fiainany, mpanoratra mizaka ny zom-pirenen'i Etazonia teraka ny 29 Aogositra 1958 ary maty ny 25 Jiona 2009 tao Los Angeles. I Joe Jackson no rainy. Ny vadiny dia Lisa Marie Presley, Debbie Rowe. Ny zanany dia Prince Michael Jackson I, Paris Katherine Jackson, Prince Michael Jackson II. Ny rahalahiny sy/na ny rahavaviny dia Rebbie Jackson, Janet Jackson, La Toya Jackson, Jermaine Jackson, Marlon Jackson, Randy Jackson, Jackie Jackson, Tito Jackson. Voaova farany tamin'ny 15 Desambra 2015 amin'ny 04:46 ity pejy ity.